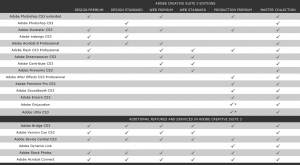 Adobe is planning a media event on March 27th (Tuesday) to announce Creative Suite 3 pricing and availability. Amazon jumped the gun a little and posted a few pages revealing product specs and pricing for several of the CS3 products with ship dates of April 20th and July 1st, depending on the product. Academic Pricing available at the Adobe Store. Prices represent full retail prices and products are linked to Amazon descriptions where applicable. "up"-links denote links to upgrade-products at Amazon. This upgrade pricing (not listed above) is available to owners of earlier versions of Adobe software. To see upgrade prices and see if you can qualify for these updates, see this full upgrade pricing table. Adobe's CS3 represents the first version of Adobe's popular graphics suite which supports Intel Macs natively. This should provide significant speed boosts over the current (PowerPC) versions running on Intel Macs. Adobe's slow transition to Intel is cited as one of the reasons for relatively slow Mac Pro sales over the past few quarters.